Mangal Singh: My little boy! I've been breaking locks since you were a kid. 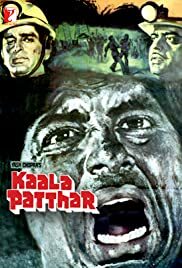 Kaala Pathar is the story of Vijay (Amitabh Bachchan) an ex-naval officer who is court-martial ed and dismissed from the navy for his role in as captain of a ship that sank and many lives were lost. Vijay is looking for a place so dark that even the hideous demons inside him that taunt him so terribly will get scared and go away. 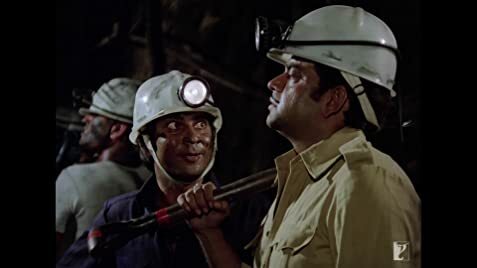 He finds that darkness in the depths of the coal mines where he now works as a coal miner, where he welcomes every danger, every threatening rumble of disaster as a chance to pay for his past Ravi (Shashi Kapoor), the engineer in-charge of these doomed mines. Doomed because the greed and mindless exploitation by its owners have made the mines into potential death traps. Ravi, seeing the terrible danger looming ahead, tries to alert the management but with little use. He is paid for his alertness by being fired from his job which is when he joins forces with the workers and Vijay in order to save the lives of the minors and fight the establishment. Mangal (Shatrughan Sinha), an escaped convict who is also looking for a place to hide, but unlike Vijay, not from himself but from the eyes of the law. And discovers that under his boisterous and egoistic exterior is a compassionate human being for whom the law of justice is more important than the law of the jungle. He ends up joining Ravi and Vijay in their fight for right. As these three men set off on their crusade, each of them also find love. From the trusting, simple miners and their families who see these men as messiahs and from three women. Sudha (Raakhee), a doctor who is as kind and caring as she is beautiful and sees Vijay's bleeding, repenting heart behind his stone-hard exterior, Anita (Parveen Babi) a reporter who falls in love with Ravi's fearless, clear-eyed belief in justice and in himself and Shanno (Neetu Singh), a gypsy whose sparkling eyes and racy sales pitch snares even the hardened heart of Mangal. Kaala Patthar is inspired by a real-life mining disaster that happened in India in the history of mining industry. On 27th Dec'75, the 'Chasanala' charcoal mine got flooded with water in which 572 workers were caught. It is an intensely dramatic film about the human heart. That as long as it beats with love and with hope, there will always be a dawn waiting at end of the blackest of nights. With a multi-star cast, a lively musical score and a nail-biting climax, Yash Chopra has made Kaala Patthar a memorable exception to the exquisitely soft, glamorous love stories that have become his hallmark. The technical side of the movie was good. The sets & make-up helped the film to become more realistic. Amitabh Bachchan's withdrawal into solitude was impressive. With a flame of anger in his eyes & confidence in his actions, he delivers minimum words and still makes an impact. Shatrughna Sinha is also good with his own style. Shashi Kapoor with his smart look is charming. Remaining Rakhi, Neetu Singh etc. are okay. The tea-stall confrontation between Bachchan and Sinha is probably the most explosive encounter between two heroes ever in Indian cinema; and Bachchan comes out with a subdued, yet strong performance.